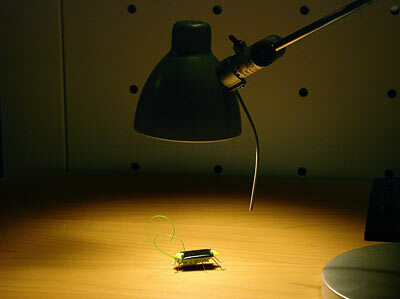 This little tiny grasshopper is both robotic and solar powered. Stick it under a bright light or out in the sun and watch it dance! As soon as the little robotic solar grasshopper see’s light it starts jumping in a frenzy while it’s eyes and legs wiggle and the antennas sway around. The Solar grasshopper comes in kit form and has been built to show people what alternative energy can do. It requires no batteries with it being solar powered and can be put together in minutes as the few parts that are needed just snap together. * No batteries and tools required and less than ten parts to snap together. 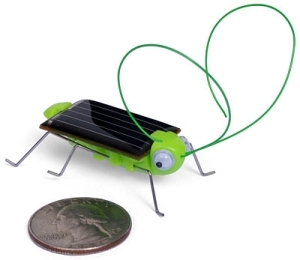 The Solar Frightened Grasshopper is available from ThinkGeek and costs $9.99. good fun for kids. Gets them interested in solar energy from an early age as well which can only be good.